Minimum order 5 wreaths to same address! 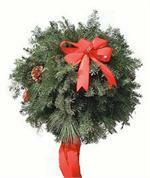 Approximately 15" in size, this wreath is great when you need a lot of wreaths for decorating window & fence post. For decorating our 15" plain wreath or your wreath. Choose this if you are adding this item to a wreath order and it is going with the wreath. Choose the shipped without wreath if all you want is the bow $5.00 shipping on just bows will be added. 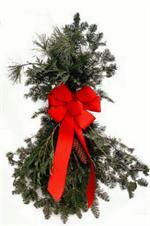 For decorating our 15" plain wreath, your wreath or anywhere you want a bow. Choose the shipped without wreath if all you want is the bow. A $4.50 shipping on just bows will be added. For decorating our 22" plain wreath or your wreath. Choose this if you are adding this item to a wreath order and it is going with the wreath. Choose the shipped without wreath if all you want is the bow $4.50 shipping on just bows will be added. 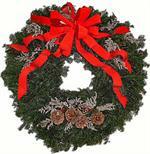 For decorating our 22" plain wreath or your wreath. Choose this if you are adding this item to a wreath order and it is going with the wreath. Choose the shipped alone if all you want is the bow $4.50 shipping on just bows will be added. Used indoors or out for decoratingthe mantle, doorway, windows, going up the lamp post or across the fence, the possibilities are endless. 1 1/2" wide ith one side flat. Easy to work with. 1 to 3 yds $10.00 per yd. 4 yds and up $8.00 per yd.